Boston-based agency, Pepper Gang, has created the ultimate resource for law firms trying to build their businesses, and amp up their digital advertising. The guide comes in the form of a whitepaper and is available for download on Pepper Gang's website. The white paper is entitled "Attorney Advertising: The Importance of Google AdWords" and provides highly detailed notes on how law firms can utilize the power of Google's paid advertising service. "Attorneys used to build their businesses through regular ads in the yellow pages. That doesn't work anymore," said Partnership Development Manager, Daniel DeMaria. "Because 96% of people searching for a lawyer now use a search engine to do so, it is crucial for law firms to take advantage of advertising online. Google is the most-used search engine and their AdWords program is extremely powerful. 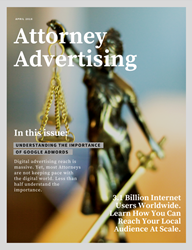 This white paper will provide a roadmap for Attorneys on how to use Google AdWords effectively." "87% of people who contact an attorney go on to hire an attorney and 72% of them only contact one attorney." "AdWords taps into the world's biggest and highest quality traffic source." "[A law firm] must minimize waste, while targeting the most relevant keywords, at the best price." "AdWords spending can be customized for any budget." Pepper Gang is the Boston-based digital marketing company committed to the growth and success of their clients' business. The company was born out of a desire to tell each brand's story in a way that compels like-minded consumers to align with the brand. Meet the Pepper Gang team and read their story at https://www.peppergang.com.